On May 1st Kenneth Fisher, CEO of Fisher Investments wrote an article called Learning To Love Debt. The idea that debt is good may be counterintuitive, but the U.S. should have more debt, not less. .... Debt is good. Historically, big deficits are followed by stock-market returns that are dramatically superior to those following surpluses--for as long as 36 months out. Still, it may be hard to fathom why budget deficits are good, since they add to our overall debt. But if you use the second question--What can you fathom that others find unfathomable?--you'll see that deficits are good because debt is good. Debt is so good, we could use much more of it. Just reading that sentence may enrage you. But anger is usually twisted fear, which can be addressed by my third question: What is your brain doing to blindside you now? The key is to untwist the fear to see reality better so we can make better stock-market bets. Is the U.S. over- or under-indebted? Since we have total assets of about $120 trillion (according to the Federal Reserve Flow of Funds Account) and a GDP of $13 trillion, our return on assets is 11% after taxes--that's very high. A current fair estimate of borrowing cost is about 6%, or 4% after taxes--much less than our return on assets. We're not over-indebted. Instead, we're falling far short of profit maximization--immorally so! We shouldn't reduce debt. In fact, we need more debt--even from stupid borrowers. The right level of debt would be when we've borrowed enough to drive interest rates up, the return down, or a combination of both. Then, we'll be optimal. But we're far from that. The U.S. has $55 trillion in debt of all types--mortgages, car loans, local and federal, according to the Federal Reserve Flow of Funds Accounts. I would argue that tripling all these types of debt would probably get us close to profit maximization and increase wealth for society. Imagine what we could invest in! Americans are only half as leveraged on real estate as they could be. It's not true that there's no more cash to take out of real estate. What about overall indebtedness? If you divide the total consumer liabilities of $13 trillion by the net worth of $55 trillion, you get 24% debt-to-equity. To put that in context, most publicly traded S&P 500 companies have much higher debt-to-equity ratios. Overall, corporations, governments and individuals aren't hurt by debt. When used responsibly, leverage increases our return on assets. Aside from the obvious argument that rising debt is good for Ken Fisher (because it is what is driving the current leverage buyout mania as well as his fees), Fisher is ignoring a simple economic fact: there is a difference between debt being financed for productive capacity and debt being used to finance consumption. Fisher makes no distinction even though repeated use of debt being used to finance consumption is guaranteed to be a problem over the long haul. Even before we get to that inevitable outcome, try telling everyone who has lost their home in foreclosure or gone bankrupt that debt is good. Please consider 'Subprime' Aftermath: Losing the Family Home. Over the past several years, seven of the 26 households on the 5100 block have taken out subprime loans, typically aimed at folks with poor or patchy credit. Some used the money to buy their houses. But most already owned their homes and used the proceeds to pay off credit cards, do renovations and maintain an appearance of middle-class fortitude amid a declining local economy. Three now face eviction because they couldn't meet rising monthly payments. Two more are showing signs of distress. The fate of people on West Outer Drive offers a glimpse of a drama that is playing out in middle- to lower-income, often minority-dominated communities across the country. In addition to putting families into homes, subprime mortgages and the brokers who peddle them are helping to take families out of homes in which they've lived for years, eroding the benefits that proponents on Wall Street and in Congress have long touted. The borrowers' difficulties raise questions about how the extension of easy credit to large swaths of the U.S. population will ultimately affect people and the broader economy -- questions that have gained in urgency as a sharp rise in defaults has policy makers wondering what, if anything, they can or should do. "The market was feeding an addict at its neediest point," says Diane Swonk, who spent 19 years analyzing consumer credit in the Midwest and now serves as chief economist at Chicago-based financial-services firm Mesirow Financial. "Individuals will resist reductions in their standard of living with everything in their power, including mortgaging their futures." If events unfold as some predict, subprime lending could end up eliminating more homeowners than it created. One study by the Center for Responsible Lending, a nonprofit that focuses on abusive lending practices, forecasts that the subprime boom will result in a total of 2.4 million foreclosures nationwide, most of them on homes people owned before taking out the loans. That outweighs even the most optimistic estimates of the number of homeowners created, which don't exceed two million. The problem noted in the WSJ article is not specific to Detroit by any means. Foreclosures and bankruptcies are soaring nationwide. According to RealtyTrac there were More than 430,000 Foreclosure filings in Q1. RealtyTrac™ the leading online marketplace for foreclosure properties, today released first-quarter data from its 2007 U.S. Foreclosure Market Report, showing more than 430,000 foreclosure filings — default notices, auction sale notices and bank repossessions — reported nationwide during the first three months of the year, up 27 percent from the previous quarter and up 35 percent from the first quarter of 2006. The nation’s quarterly foreclosure rate of one foreclosure filing for every 264 households was the highest quarterly foreclosure rate since RealtyTrac began issuing its report 27 months ago. Ask those 430,000 if they did not have enough debt. See what kind of answer you get. Of course Fisher would use the cop-out that those who were foreclosed on did not use debt responsibly. His convenient definition in realty must mean "as long as you don't blow up". I am curious about whether or not Fisher has leveraged his home to the max like he seems to be advising everyone else to. If everyone did just Imagine what we could invest in! At no time does it occur to Fisher that there might not be anything worthwhile to invest in, especially with leverage. What Fisher is proposing amounts to one massive margin position on one's home and borrowing at a rate of say 6.5% to do it. A normal housing correction can (and in fact already has) wiped out that margin. The result: rising foreclosures. Now what would happen if the stock market (a market that has gone parabolic) takes a mere 30% dive and stays down for say 5 years? Fisher acts as if that idea is impossible. It's not. But if Fisher thinks it is impossible and is encouraging everyone else to use leverage, inquiring minds might be wondering what Fisher himself is doing. I gave a call to Fisher Investments and asked if Fisher uses leverage. I was told no. Hmmm., If leverage is so good for everyone else, why isn't it good for Fisher Investments? Perhaps leverage can be used responsibly by everyone else other than Fisher himself. Or perhaps Fisher wants everyone else to take that risk (so he can benefit) without him taking such a risk himself. Scott Reamer on Minyanville wrote a well reasoned rebuttal to Fisher's article. Scott's rebuttal is called Should We Really Have More Debt? Following is a synopsis but I recommend reading the entire article. Fisher attempts to confuse the types of debts: corporate, government, and personal: “Consider this: Do folks fret when GE or Apple incur debt? Hardly. Most rational people understand that corporations use debt responsibly all the time to grow, invest in research and develop cool new iterations of the iPod. There is a difference – a large and very important difference – between the two main types of debts: Self Liquidating Debt, and Consumptive Debt. 1) Self Liquidating Debt is borrowing money to create widgets that are sold to pay back the money that is used to produce them in the first place. That is what companies such as GE or Apple do every day. 2) Consumptive Debt, however, are debts that are taken to provide for purchasing a good that is consumed. It is a truism that production is funded out of savings (future savings or present savings). Thus, one cannot go on forever consuming things without producing them. Thus, taking out consumption debt at a far greater rate than productive debt is a policy that has a limit and an end. And guess what: by FAR, the debts that have been incurred by consumers have been consumptive debts and not of the self liquidating variety. But here’s where he rests his case: "This is true in theory, but the ultimate proof is the stock market." Voila, a recursive argument: we need to have a higher debt load because going into debt has created higher stock prices. But as we saw above, the 1980s/90s/00s have shown that monetary debt creation has manifested in inflation in asset markets, NOT the general economy. Thus, creating money out of thin air has created higher nominal stock prices as that’s where the money is going because of the incented speculation on the part of corporations and consumers. Thus, he is really arguing that we should create more government debt because higher debt levels lead to higher nominal stock prices. Nominal being the key word (you know the argument already that REAL stock prices are 25-50% less than in 2000). A few things he never mentions are: the widening gap between rich and poor that is itself a a function of debt creation; nor does he mention the larger and more disruptive shocks the economy has felt as a result of explosive debt creation over the last four decades; nor the growth of the government as a percentage of GDP. All of these things are demonstrably bad (read history) and they are all fueled by debt creation. As a manager of a $30 billion mutual fund complex, Fisher wants debts to grow as high as they can simply because that new money has shown the remarkable ability to make its way first and foremost into the stock market. Rising stocks means rising fees for Fisher investments, no matter what his actual performance. Case closed. Purposely or not, Fisher is begging people to take on leverage without so much as once stating the downside risks. 430,000 people in the first quarter of 2007 alone have now found out about the downside risks. And the more parabolic the stock market goes and the higher the 10 year treasury yield goes with it, the more risk Fisher continues to ignore. There is an interesting 5 part You-Tube series on money and debt. It covers in nice cartoon animation what has happened to money over time, fractional reserve lending, how money is created today, why interest rates are so low, why we get unsolicited credit offers, and why debt is exploding. The video concludes that it is taking exponential increases in debt (money) to stave off a a collapse of the entire banking system, and that this cannot go on forever. Click here (not on the image above) to see this 5 part series on debt. "Debt... That's what our money system is. If there were no debts in our money system, there wouldn't be any money." Marriner S. Eccles. Chairman and Governor of the Federal Reserve Board. This is a staggering thought. Someone has to borrow every dollar we have in circulation, cash or credit. We are absolutely, without a permanent money system. When one gets a complete grasp of the picture, the tragic absurdity of our hopeless position is almost incredible, but there it is." Robert H. Hemphill, Credit Manager, Federal Reserve Bank, Atlanta Georgia. Unfortunately the video's conclusion is a bunch of socialist nonsense: Eliminate interest, let governments and only governments create money, and supposedly government will then use that money wisely to build roads and bridges that will add value to society. The government cannot decide what has value or not. Only the free market can do that. Otherwise you have bridges built to nowhere based on political clout, needless wars, and other malinvestments of capital. If government printing led to prosperity we would be talking about Zimbabwe, the Weimar Republic, and the Soviet style command economy of the 1940's through 1980's in glowing terms. The proposed solution is ridiculous. The video also incorrectly blames the gold standard for problems created by fractional reserve lending. 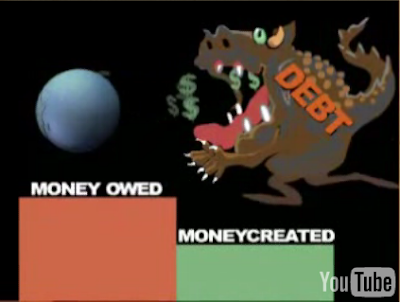 However, the video does a reasonable job of pointing out many of the problems with the current system of debt creation in a very entertaining and (for the most part) educational way. On that basis, I recommend watching all five parts.